What is a New Mexico Month to Month Lease Agreement? New Mexico Month to Month Lease Agreement: What Is It? 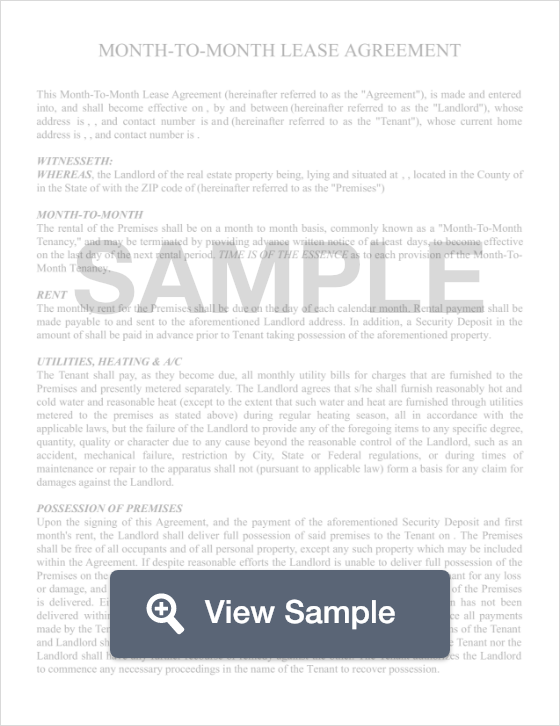 In the state of New Mexico, a month to month lease agreement is a legal document that landlords use to initiate a short-term lease agreement. These documents differ from traditional long term leases due to the fact that they are only valid for a month. However, these leases renew at the beginning of each month until they are eventually terminated by the landlord or tenant. Besides the fact that month to month leases continue to renew each month, they contain the same information that one would find in a long term lease, including rent amount, due date, late fees, riles of occupancy, parking provisions and etc. When a landlord or tenant wishes to terminate the lease, a termination letter must be written and given to the other party. In addition, this letter must be submitted at least 30 days before the termination will take effect. According to New Mexico state law, any tenant or landlord who wishes to terminate a month to month lease must do so in writing. In addition, this termination letter must be submitted to the other party no later than 30 days before the periodic rental date that appears on the lease. For example, if the lease is dated May 3rd, the termination letter must be dated and submitted no later than April 3rd.